It has taken a while to get round to reviewing a recent new treatise on EU competition law and economics by Damien Gerardin, Anne Layne-Farrar and Nicolas Petit, the book having landed on this reviewer’s desk before the summer. Mea culpa. Better late than never, though, especially as the book, co-authored by two lawyers with considerable experience of academia and practice and a specialist competition economist, is actually a good read. The first question that tends to spring to mind before commencing a book review is: who is the intended audience? That is a pertinent question here. After all, there are now various practitioner works on EU competition law in the English language: think, in particular, of two others in the OUP stable, Bellamy and Child and Faull and Nikpay – so well known are they among practitioners that reference to the (original) authors suffices). OUP also publishes Whish and Bailey, which is aimed primarily at students but which practitioners also find useful. There other general practitioner works, such as Van Bael and Bellis, and a host of more specialist works. Why, then, add another treatise on competition law to a burgeoning stable? This, it turns out, is a fair description of what the book does – and, in very large part, it does it very well. This reviewer particularly liked chapter 2, which contains an accessible yet thorough introduction to competition economics: in addition to explaining the main theories and concepts, there is plentiful reference in the footnotes to literature on both sides of the Atlantic. 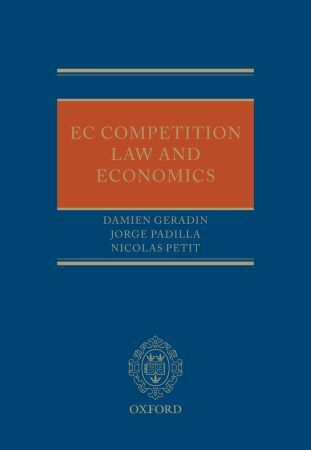 The chapters dealing with the principal business phenomena attracting the application of the competition rules – agreements among competitors, distribution agreements, monopolistic conduct and so on – are also excellent, containing detailed treatment of the various issues that have arisen in the case law and decisional practice of the EU Courts and Commission respectively, together with economic analysis. To take but one example, the authors explain why single branding and other exclusivity agreements in a vertical context might be pro-competitive or anti-competitive, depending on the circumstances (pp466-468); again, there is copious reference to the economics literature for those who wish to conduct further research. Likewise, the long chapter on abuse of dominance contains both a good primer on the main cases under each type of abuse together with critical comment on the law where, in the authors’ view, the Courts or Commission has gone wrong (the Tomra judgment of the General Court, since upheld by the CJEU, comes in for particularly scathing criticism). My only minor quibble with the book is that it is perhaps a little lumpy: some topics are given in-depth treatment (witness the 13 pages on the notion of collective dominance, compared with just 7 pages on dominance more generally) whilst other important topics are given rather rudimentary treatment (in particular, the controversial and in practice often critical concept of a restriction by “object” under Article 101(1) TFEU merits, in this reviewer’s opinion, more than the 2 pages given over to it). Perhaps, if a second edition is prepared – and this author hopes so – this might be remedied. At £185 this book is not cheap (although, to be fair, it is considerably cheaper than Bellamy and Child and Faull and Nikpay). It will not, in all likelihood, be purchased by students. It may not be purchased by many practitioners, either: in addition to the standard reference works, there are other works that deal in similar vein with at least some of the same subject matter covered by this book (think of O’Donoghue and Padilla’s book on abuse of dominance and books on competition economics such as those by Neils, Jenkins and Kavanagh and Bishop and Walker). If it is only purchased by relatively few, however, that would be a real shame. There is much to like in the book, and despite the overlap with other texts it does contain more than enough that is different to warrant the outlay. It will be much consulted by this reviewer in the months and years to come. This entry was posted in Features, Reviews and tagged Christopher Brown, competition law by eutopialaw. Bookmark the permalink.